"At times like this, it helps to have people that can fly." There are some series which, by the time they have run 40 episodes, have become stale and predictable. 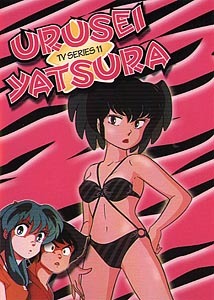 That can't be said for Urusei Yatsura, despite its not having a singular story arc with major climax points. Where this show excels is in its characters, whose behavior, while well established, deliver unexpected reactions when faced with new situations. While no one should be surprised to see Ataru chasing after every beautiful girl he can find, or Lum delivering electrifying retribution for Ataru's unfaithfulness, how they handle themselves in the scenarios on this disc proves that you can never second guess Urusei Yatsura. After living together as a married couple since her arrival on Earth, Lum is determined to have Ataru take her out on a real date, but he doesn't see the point until she threatens to destroy his address book with all his other potential girlfriends' phone numbers in it. When she gets dolled up for the outing, he realizes it may not be so bad after all, but Lum expects to take their relationship to new heights. Their trip to the pool attracts some unwanted attention, but is Ataru ready to take the plunge? What follows makes for a Thrilling Summer Date. So Long, Goodbye Summer Days finds the gang seaside, where the quest is on for watermelons, which are the necessary element for a squashing game. What they didn't expect is that the fruit is the center of the local religion, and when they come across a giant melon idol with an attitude, things turn nasty. This trip could wind up being the pits! The weather is getting rough, and its time to batten down the hatches, as Ten and Lum are looking forward to the oncoming storm front. The Moroboshi family is holed up inside the house, but like all things when aliens are around, things are going to get weird. When a leak develops in the roof, Lum comes up with a device that stops the water from falling...until there is as much on the ceiling as there is on the floor. Huddled in the stairwell as water encroaches from above and below, it may be hard not to Panic in a Typhoon. All hell breaks loose when Ten discovers a new lunchtime treat—pickled plums! What is unexpected is that these are highly inebriating to aliens, and when Lum discovers their effects herself, the two of them are on a quest to raid every bento box in school. Knowing how much trouble these two can cause even when sober, nobody is ready for them on a bender. Another four hilarious episodes are collected here, with the typhoon installment probably the best of the bunch. Urusei Yatsura just keeps on dishing out quality comedic content with no signs of stopping. The great voice acting really make the characters come alive, and the predicaments they get into make for a lot of crazy fun. Image Transfer Review: Consistent with previous discs, this looks very good for a twenty-year-old series. Colors are strong, black levels solid. There is some bleeding at times, a few rainbows, and some slight ghosting throughout. Print defects are minimal. Dark blues are most problematic, showing a fair amount of grain, and some macroblocking on occasion. The credits sequences fare the worst. Audio Transfer Review: The mono Japanese audio track sounds as good as can be expected for a show of this vintage. Frequency range is respectable, and for the most part the sound is free of distortion or edginess. Hiss is audible throughout, but not overbearing. Extras Review: Chapter stops are available for each full episode. A single sheet of liner notes covers more of the show's cultural references, and there are some pretty funny bits included. Princess Kurama of the Karasutengu (crow goblins) gets a bio on the back cover this time out. Outrageous nd unrelenting, if there is one show I can always rely on to bring a smile to my face it's Urusei Yatsura, which continues to entertain with its wacky situations and kooky characters. This is great, old school anime that bests most of its followers. While it will reach retail individually in the future, at press time, disc 11 opens the third limited boxed set available directly from AnimEigo. Recommended.